Bodybuilding contests over the years have been judged using a number of different procedures. In the early days of "Physical Culture" contests, competitors were required to demonstrate their athletic ability on stage---a precursor of today&apos;s fitness contests for women. 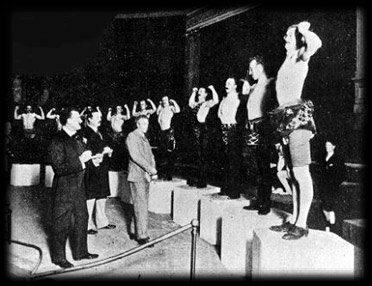 Many early bodybuilding contests also involved evaluating the personalities and public speaking abilities of the contestants, who would talk briefly on stage in addition to showing off their physiques. The point of any and all of these judging systems and procedures is (or at least should be) to identify the best bodybuilders and rank them according to excellence. That is, the goal of judging is not to define what good bodybuilding is supposed to be but to recognize it. Picture of the old system of judging! Ultimately, it is the bodybuilders themselves who define what is possible in physique competition. Judges would not expect to see, or to demand to see, for example, cross-striations in the glutes unless or until they had already seen such a level of development on stage. As in other sports such as gymnastics and diving, a competitor comes along and establishes a new standard---maybe one previously thought to be impossible---and then suddenly everyone else starts working to duplicate that feat. As an example, looks how long it took for runners to break the four-minute mile barrier. But once one runner did it, suddenly hundreds were accomplishing the same thing. Fundamentally, judging in bodybuilding is based on the ability of the judges to know what a good bodybuilder looks like when they see one. If a judge doesn&apos;t have a good "eye" for bodybuilding, it doesn&apos;t really matter what kind of system of rules is used. So the effectiveness of judging rules and procedures should be evaluated basically using one criteria---does the system help the judges in identifying the best bodybuilders, or does it make it difficult or even impossible for them to do so? In an NPC contest, each bodybuilder in a class comes out individually and does a one-minute free-posing routine, with no music. The entire line-up is then brought out on stage together and the judges bring out groups of competitors---starting with what seems to be the top five or so---for comparison posing. There are no "mandatory" poses as such, but the bodybuilders are generally asked to do most of the common, conventional physique poses---front double-biceps, lat spread, side-chest and so forth. However, the judges can call for any pose they want---a most muscular, for example, or simply for "your best leg shot." NPC judges don&apos;t score the rounds separately, but simply rank each bodybuilder in order once prejudging for the class is over. So when an NPC judge finally places a competitor, that score doesn&apos;t reflect any single aspect of the bodybuilder&apos;s physique or presentation but a complete, overall evaluation of his or her excellence. The IFBB, which sanctions international amateur and professional bodybuilding competition, has a more complex and structured set of judging procedures. The prejudging consists of two rounds. In the first, the bodybuilders assume a "standing relaxed" posture (something like standing at attention, arms at the sides) and are looked at from the front, back and both sides. In the second, the competitors go through a very specific set of mandatory poses. In both rounds, the bodybuilders are looked at individually and are compared as well, although unlike the NPC system - where the judges can call out any number of competitors in a group - usually only three competitors are brought out for comparison at a time. Another difference between the NPC and the IFBB procedures is that IFBB judges score each round separately, placing the bodybuilders in order of excellence for that individual round, and a competitor&apos;s score represents his or her cumulative scores from all of the rounds. IFBB scoring is not completed once prejudging is over. The competitors don&apos;t do their free posing during prejudging, but are evaluated by the judges as they perform their routines to music in the finals. Once the third round is completed and the scores are added up, the top finalists are then brought out for an additional "pose-down" round and have an opportunity to make a final impression on the judges. The IFBB system of judging has been largely effective, with comparatively few controversial decisions resulting (except for the intrusion of the politically-inspired "guidelines" recently applied to female bodybuilding) when you consider how difficult it is to achieve an "objective" consensus of something with so subjective a nature as bodybuilding judging. But when problems have arisen, it is often because there is a tendency on the part of some judges, when working within such a highly structured system, to forget that bodybuilding is a physique contest and that every round in a bodybuilding contest is supposed to be a physique round. That is, the judges are supposed to look at every aspect of the competitors in every round and to judge each round as if that were the entire contest. Judges should say to themselves, "If this were all I was going to get to see of these bodybuilders, if this were the whole contest, whom would I place first, second, third and so forth?" But this often doesn&apos;t happen. For example, the "standing relaxed" round is often called the "symmetry round." This is because, when the bodybuilders are not flexing and posing, and they can&apos;t cover up physique faults by how they hit their poses, the aspects of their physiques that stand out tend to be their overall shape, symmetry and proportion. But the first round is not symmetry round - that is, it is not a round in which the judges are looking at symmetry as if it were a separate and distinct element of the bodybuilding physique. It is a physique round in which every feature of the body that can be observed should be considered. For example, a judge should not give a high placing to a competitor with an aesthetic shape and good proportions, but who lacks mass or density, is not hard and defined or who is lacking in any other aspect of physical development or conditioning. As with the other rounds, the judges should score the competitors as if this were the entire contest, decided on the basis of what they can see while the competitors are "standing relaxed" who the best bodybuilders on stage are in order of excellence. The same is true of the second round. The bodybuilders do mandatory poses, flex their muscles, and this tends to show off their muscularity, but it is not "muscularity" round. Of course, when competitors start to pose a physique that seemed relatively unimpressive in round one can seem to come alive, muscles popping out all over. But while this should certainly count in her or his favor, it doesn&apos;t mean a bodybuilder&apos;s other obvious faults or weaknesses should be ignored. Again, the judges are supposed to look at the competitors in this round and ask themselves, "Who would I place first, second and so forth if this round were the entire contest and this was all I was going to see?" The point of the different rounds is giving the judges as much information as possible on the physiques they are evaluating. You see different things when a competitor is just standing there or when he or she flexes and poses. Someone who doesn&apos;t impress you in one round might well change your mind in another. But the bodybuilding physique must always be looked at as a whole and be judged and evaluated in its entirety in each and every round. When it comes to round three, presentation is a vitally important aspect of a physique contest, but it is not a "posing" round. The idea of posing is a simple one: the competitor has had to show the judges his or her physique the way they wanted to see it; in round three, the bodybuilders have a chance to show-off their development in a way that maximizes their strong points and minimizes their weaknesses. But the physique being presented in round three is the same one the judges have seen in the previous two rounds---and they pretty much know what it looks like by now. So bodybuilders shouldn&apos;t expect to jump a whole lot of places in the scoring because they are able to do an exciting routine. They might, however, in calling attention to certain of their strengths, cause a judge to think, "You know, that bodybuilder is really better than I gave him (or her) credit for." Its an unfortunate fact of genetics that many physiques don&apos;t look all that good in certain poses---although they might be very impressive in others. And that&apos;s what round three is all about---showing the judges your physique in a way that is the most flattering to you and impressive as possible. The IFBB judging system obviously works, and the judges who officiate in IFBB contests have proven track records. But there has been a tendency on the part of judges, bodybuilders and spectators alike to think of round one as a "symmetry" round, round two as a "muscularity" round and the third round as a "posing round," and therefore to look at isolated aspects of the physique (or non-physique aspects such as posing) rather than the physique as a whole. This approach to judging can skew the results in such a way that, in spite of the best intentions of the judges, some of the competitors might not receive the placings they really deserve.